This facility was the second factory of Bernard Bloch who had started off with the Majolika- und Fayence-Fabrik Hohenstein in nearby Hohenstein twenty years earlier. In 1911 Alois Krautzberger together with his two partners Mayer and Purkert, which mainly acted as financial backers, purchased the former oven factory of the Eichwalder Porzellan-, Ofen- und Wandplattenfabriken B. Bloch from Eichwald which at that time was restructuring itself following the death of its founder Bernard Bloch two years earlier. As the factory was fully operational at that time only minor modifications were required to enable porcelain production, in fact the switch went so well that the factory already had around 80 workers in 1913. In 1922 the engineer Karl Langer (*1882, †1962) joined as minor partner and became technical director of the factory before advancing to full partner in 1930, the same year the employee count hit the number of 220. 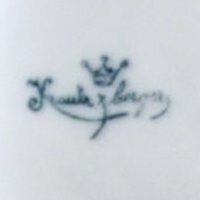 The company itself became relatively well known for its tableware decorated in various over- and underglaze styles, but the main business was covered by hotel- and restaurantware as well as kitchenware like canister sets and storage shelve drawers. Next to local decorations, the company from 1913 onwards also very successfully created items using the famous "Zwiebelmuster" (Blue Onion) or "Strohblume" (Strawflower) decoration styles. In mid-1937 the number of workers was still stable at 220, there had been no dramatic changes during the last years. But when German forces started to push through parts of Bohemia following October 1st 1938, the factory was closed in fear of things to come. Still, large parts of the factory were destroyed during the war. In February 1940, the Germans ordered 20 French prisoners-of-war to start clearing the premises of what soon should become STALAG IV C.
Some people may be confused why the company appeared to use the name Kaempe in some marks. 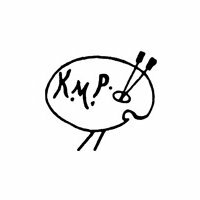 It's an artificial construct representing the German pronunciation of the initials 'K-M-P', literally 'Ka-Em-Pe'. Used between 1911 and 1918, green or red. 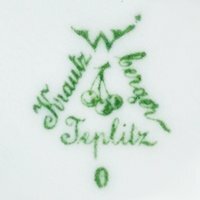 'W' above triangular 'KRAUTZ-BERGER' and 'TEPLITZ'. Used between 1911 and 1922, blue only. 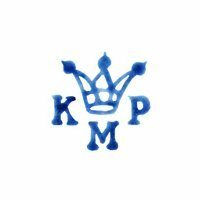 Crown above the initials 'KMP'. Used between 1911 and 1924, green or blue. 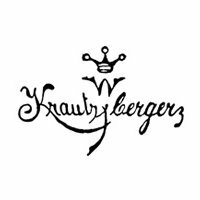 Crown above a 'W' above 'KRAUTZBERGER'. Used between 1911 and 1924, green or blue. Same as before but without the 'W' in between. Used around 1912. Palette, brushes, and the initials 'KMP'. Used between 1912 and 1918, red only. 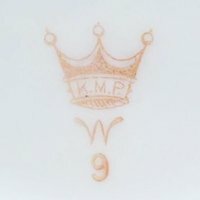 Crown including initials 'KMP' above 'W' for Wistritz. Used between 1918 and 1938, green only. 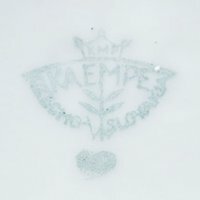 Crown including initials 'KMP' above 'KAEMPE' and 'CZECHOSLOVAKIA'. Used between 1918 and 1938, green or red. 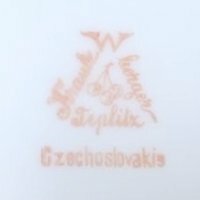 'W' above triangular 'KRAUTZ-BERGER' and 'TEPLITZ' above 'CZECHOSLOVAKIA'. Used between 1918 and 1938, red only. 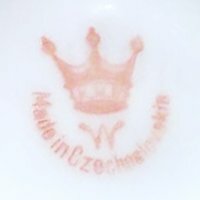 Crown including initials 'KMP' above 'W' for Wistritz above 'MADE IN CZECHOSLOVAKIA'. Used between 1918 and 1938, red only. 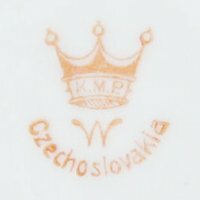 Crown including initials 'KMP' above 'W' for Wistritz above 'CZECHOSLOVAKIA'.